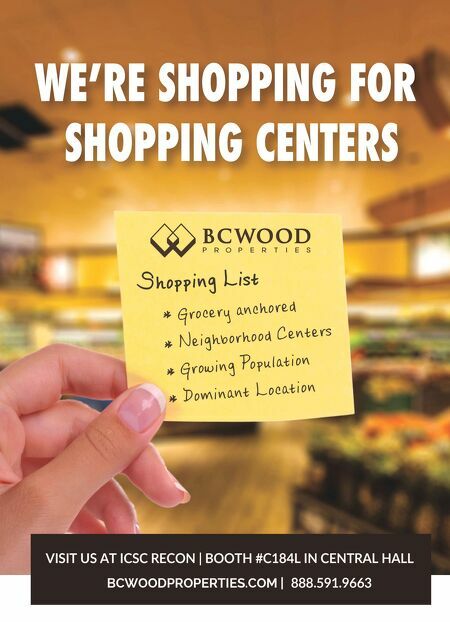 LANDSCAPE DESIGN 180 • SHOPPING CENTER BUSINESS • May 2018 Coast University in Estero, halfway be- tween Naples and Fort Myers. The retail portion of the project is oriented toward a central paseo, with a main courtyard facing the lake and the residential build- ings. The community will create an envi- ronment where students, faculty and staff can meet, shop and eat. "Creating an experience for the con- sumer is vital and gathering and activity areas can promote that," says Anand of KTGY. Amador of Lifescapes agrees that cen- tral gathering areas are an integral part of the firm's design strategy. The redevelopment at Barefoot Land- ing will include 45,000 square feet of new retail space, a new restaurant district, the addition of an amphitheater and a new boardwalk. In addition, Lifescapes will add more shaded patio space through- out the center and a water entertainment feature that will incorporate music and fireworks. "We are creating zones where people can gather for periodic events," says Ama- dor. The lawn area will be used for car shows, a farmers market, art shows or other local regional events. 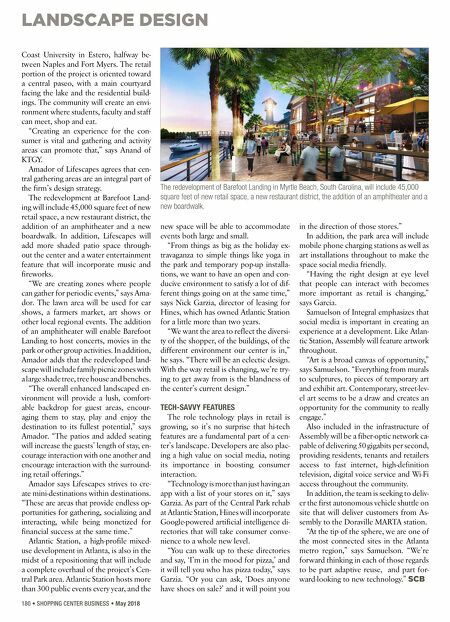 The addition of an amphitheater will enable Barefoot Landing to host concerts, movies in the park or other group activities. In addition, Amador adds that the redeveloped land- scape will include family picnic zones with a large shade tree, tree house and benches. "The overall enhanced landscaped en- vironment will provide a lush, comfort- able backdrop for guest areas, encour- aging them to stay, play and enjoy the destination to its fullest potential," says Amador. "The patios and added seating will increase the guests' length of stay, en- courage interaction with one another and encourage interaction with the surround- ing retail offerings." Amador says Lifescapes strives to cre- ate mini-destinations within destinations. "These are areas that provide endless op- portunities for gathering, socializing and interacting, while being monetized for financial success at the same time." Atlantic Station, a high-profile mixed- use development in Atlanta, is also in the midst of a repositioning that will include a complete overhaul of the project's Cen- tral Park area. Atlantic Station hosts more than 300 public events every year, and the new space will be able to accommodate events both large and small. "From things as big as the holiday ex- travaganza to simple things like yoga in the park and temporary pop-up installa- tions, we want to have an open and con- ducive environment to satisfy a lot of dif- ferent things going on at the same time," says Nick Garzia, director of leasing for Hines, which has owned Atlantic Station for a little more than two years. "We want the area to reflect the diversi- ty of the shopper, of the buildings, of the different environment our center is in," he says. "There will be an eclectic design. With the way retail is changing, we're try- ing to get away from is the blandness of the center's current design." TECH-SAVVY FEATURES The role technology plays in retail is growing, so it's no surprise that hi-tech features are a fundamental part of a cen- ter's landscape. Developers are also plac- ing a high value on social media, noting its importance in boosting consumer interaction. "Technology is more than just having an app with a list of your stores on it," says Garzia. As part of the Central Park rehab at Atlantic Station, Hines will incorporate Google-powered artificial intelligence di- rectories that will take consumer conve- nience to a whole new level. "You can walk up to these directories and say, 'I'm in the mood for pizza,' and it will tell you who has pizza today," says Garzia. "Or you can ask, 'Does anyone have shoes on sale?' and it will point you in the direction of those stores." In addition, the park area will include mobile phone charging stations as well as art installations throughout to make the space social media friendly. "Having the right design at eye level that people can interact with becomes more important as retail is changing," says Garcia. Samuelson of Integral emphasizes that social media is important in creating an experience at a development. Like Atlan- tic Station, Assembly will feature artwork throughout. "Art is a broad canvas of opportunity," says Samuelson. "Everything from murals to sculptures, to pieces of temporary art and exhibit art. Contemporary, street-lev- el art seems to be a draw and creates an opportunity for the community to really engage." Also included in the infrastructure of Assembly will be a fiber-optic network ca- pable of delivering 50 gigabits per second, providing residents, tenants and retailers access to fast internet, high-definition television, digital voice service and Wi-Fi access throughout the community. In addition, the team is seeking to deliv- er the first autonomous vehicle shuttle on site that will deliver customers from As- sembly to the Doraville MARTA station. "At the tip of the sphere, we are one of the most connected sites in the Atlanta metro region," says Samuelson. "We're forward thinking in each of those regards to be part adaptive reuse, and part for- ward-looking to new technology." SCB The redevelopment of Barefoot Landing in Myrtle Beach, South Carolina, will include 45,000 square feet of new retail space, a new restaurant district, the addition of an amphitheater and a new boardwalk.